NASA's car-size Curiosity rover is days away from its high-stakes landing on Mars, and a host of planned events will allow people to follow along as the spacecraft makes its thrilling journey to the surface of the Red Planet. After traveling through space for about 8.5 months, Curiosity (also called the Mars Science Laboratory) is scheduled to touch down on Mars on Aug. 5 at 10:31 p.m. PDT (1:31 a.m. EDT Aug. 6; 0531 GMT). The rover will descend to the surface attached to a rocket-powered sky crane, which will be used to slow the spacecraft's speed from more than 13,000 miles per hour (21,000 kilometers per hour) to zero as it flies through the Martian atmosphere. This unprecedented landing is so complex that it has been nicknamed "the seven minutes of terror." 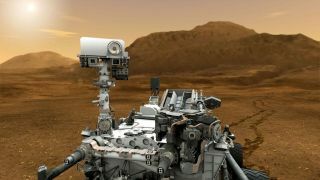 "The Curiosity landing is the hardest NASA robotic mission ever attempted in the history of exploration of Mars, or any of our robotic exploration," John Grunsfeld, NASA's associate administrator for science missions, said in a recent news briefing. It also helps that the high-profile landing happens to fall during a time when more people, particularly students, are able to pay close attention, Grunsfeld said. "Given that we are in the heart of summer, there's a real opportunity to achieve tremendous broad public engagement on this adventure on Mars," he said. NASA is planning a host of events for educational outreach and to build awareness about the mission among the public. "We're going to engage summer camps, science centers, our NASA centers," Grunsfeld said. "In fact, all around the world, people will be following the Mars Science Laboratory landing and the subsequent adventures of the Curiosity rover." The agency is hosting its first-ever multi-center social media event tomorrow (Aug. 3). The simulcast event will connect seven NASA centers, including the agency's Jet Propulsion Laboratory in Pasadena, Calif., the mission control epicenter for the Mars Science Laboratory mission. The multi-center event, called NASA Social, will teach people about the Curiosity rover's mission and will offer a glimpse into each participating NASA center. In addition to the Jet Propulsion Laboratory, NASA Social will bring together the Ames Research Center in Moffett Field, Calif.; the Glenn Research Center in Cleveland; the Goddard Space Flight Center in Greenbelt, Md. ; the Johnson Space Center in Houston; and the Langley Research Center in Hampton, Va. This illustration depicts the moment immediately after the Curiosity rover touches down on the Red Planet. NASA also partnered with Microsoft to release a free game for Xbox 360 and Kinect motion sensor systems to let people try their hand at landing a rover on Mars. Curiosity's Mars landing will also be shown live on a giant LED television screen on Sunday night (Aug. 5) in the heart of New York's Times Square. Live coverage from NASA Television will be broadcast on a Toshiba Vision screen that hangs below the New Year's Eve ball in Times Square, agency officials announced July 31. With these efforts, NASA is hoping to increase public awareness about the Mars Science Laboratory mission and to inspire people about future Mars exploration. "Forty-three years ago, the Apollo 11 mission launched to the moon," Grunsfeld said. "I hope the MSL Curiosity landing will be as memorable and as exciting for kids today as the Apollo 11 landing was when I was at summer camp." But NASA isn't the only organization planning outreach events to mark the Mars rover landing. The Mars Society, a nonprofit advocacy organization, is holding its 15th Annual International Mars Society Convention in Pasadena from Aug. 3 to 5. The event will gather scientists, policymakers and other experts to discuss Mars exploration and efforts toward a manned mission to the Red Planet in the future. The Planetary Society, another nonprofit group, will also be hosting an event in Pasadena over the weekend. The Planetary Society's "Planetfest 2012" will be held on Aug. 4 and 5 to celebrate the historic Mars rover landing. The two-day event will feature speakers, family activities, art exhibits and displays of spacecraft and other space instruments. Participants will also have the opportunity to touch a real Mars meteorite and explore the cockpit of a commercial suborbital space plane. "There is nothing like it, the big room at Planetfest will be the most exciting place to watch, share and celebrate, as we open the astonishing next chapter of discovery on Mars," Bill Nye, CEO of The Planetary Society, said in a statement.